This is a top-of-the-range Raleigh used for exhibitions and shop displays, and similar to the ‘Boss Bike’ manufactured for the African market. I bought this All-Chrome in 2007. A friend insisted on buying it from me a few years ago; he recently gave up cycling so I bought all his bikes (ie bikes I used to own). The chrome is a little tarnished here and there. A good polishing would help it shine. If you want to turn it into a display bike, you could also replace a few components with new shiny parts. The All-Crome is one of the rarest Raleigh models, and is ideal for both a collector looking for investment and a bike rider who likes to stand out from the crowd. It has new Schwalbe tyres and is ready to ride. The difference between a British All-Chrome display Raleigh and its African cousin? – This one has a Sturmey Archer 3-Speed hub (dated 1979) rather than the coaster brake which was fitted to the Nigerian-built models. 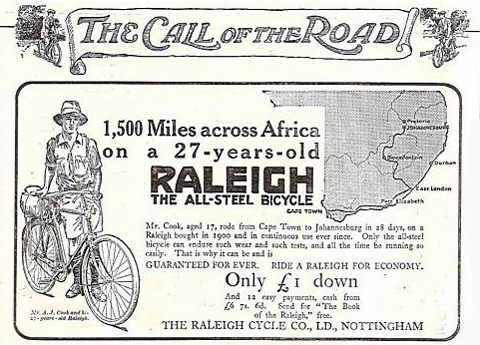 African Raleighs also had 2″ balloon tyres, while this has standard 28″ x 1 1/2. This All-Chrome was perhaps made for the German market, as I’ve seen mention of them being in German catalogues of the early 1980s. Or it might have been used in Great Britain for exhibitions and shop displays by a Raleigh cycle agent.